Heat oven to 400 degrees. Oil a 9-inch springform pan or pie plate; set aside. In a medium saucepan, bring 2 1/4 cups water to a boil. Whisking constantly, slowly add the polenta. Reduce heat to low and cook, stirring, until the polenta starts to pull away from the side of the pan, 4 to 5 minutes. Stir in the Parmesan, ½ teaspoon salt, and ¼ teaspoon pepper. Using a spoon, spread the polenta over the bottom and up the sides of the prepared pan. In a bowl, combine the radicchio, tomatoes, Mozzarella, the remaining tablespoon of oil, and ¼ teaspoon each of salt and pepper. Spoon the mixture over the polenta and bake until the polenta is crisp around the edges, 25 to 30 minutes. Serves 4. Tip: This baked polenta crust can accommodate almost any pizza topping. Try arugula and prosciutto, cooked sausage and garlic, or caramelized onions and mushrooms. The Lange family emigrated from Germany to Lodi, California in the 1870s. They started out growing melons. In 1916 the family expanded their crops by purchasing a grape ranch, which was their initial step into the wine industry. The Lange family have been growing grapes ever since. The great grandsons, twins Randall and Brad Lange, oversee the family business. It’s easy to see how they decided on a name for their winery. Their children – the fifth generation of Langes – are all involved in the family business. 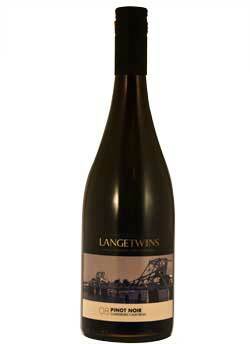 Langetwins 2008 Pinot Noir is a delightful and unpretentious wine. Made by blending wine from French and American oak barrels, this wine has good a varietal scent and character. It is a medium-bodied, well-balanced wine showing classic fresh berry flavors, soft tannins and a clean finish. At only 13.2 percent alcohol, it is very drinkable; and priced at $14.99, it is also a great value! Perfect to serve at any occasion and with most anything that begs for a delicious red wine, even pizza!